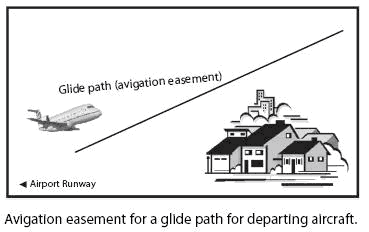 An easement obtained by airport authorities, through purchase or condemnation,and used to provide clear access for low-flying aircraft on the glide path. In cases where an airport has continually operated for several years, a municipality could argue that it has a prescriptive avigation easement as a defense to a takings claim. 2d Aviation [section] 8 (2009) (noting that "[t]here is a conflict of authority as to whether an avigation easement may be obtained by prescription"). At least one case has applied a six year statute of limitations to preclude a takings claim for an avigation easement against the United States Government, with the six-year period beginning to toll when aircraft began flying over the subject property. The property was subject to an earlier avigation easement granted to the U.
Residences in that area built after 1976 are not eligible for the program because of existing avigation easement agreements. If there is one type of the bundle of rights taking that strikes fear into the hearts of property owners but, for some reason, matters little to the powers that be (condemnors), it's the avigation easement. The avigation easement brings with it the threat of thundering planes, immense downfalls of soot and fuel leakage, shock waves that rattle pots and pans, restrictions on home lighting, height limitations, perpetual and continuing rights to all air space and underlying ground to ensure the safe and continuing fight of all aircraft to fly over the property. Also, the city must obtain avigation easements for all project properties. Tenders are invited for Project consists of planting trees and landscape plantings on several LRAA owned properties, Louisville Metro Public Right of Way and approximately 20 residentially owned properties that currently have avigation easements with LRAA over Bowman Field landing approaches. The purpose of this Request for Proposals (RFP) is to solicit sealed proposals to establish a contract through competitive negotiations for providing professional architectural and engineering (A&E) and project management services to include, land surveying, land acquisition, avigation easements, environmental studies, grant administration, construction administration, and other related services for Hanover County Airport. Under a separate project, the City will acquire avigation easements from private property owners to allow for the removal of these trees.